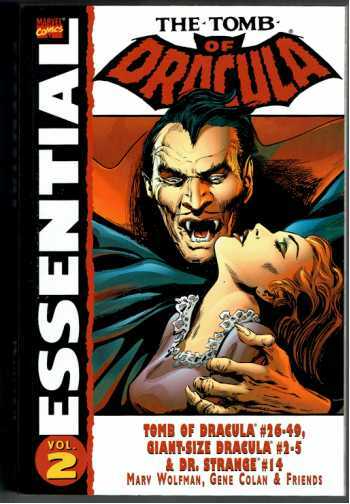 This volume of the Essential Dracula contains Tomb of Dracula #26-49, Giant-size Dracula #2-5, and Dr. Strange #14. Written by MARV WOLFMAN, CHRIS CLAREMONT, and DAVID KRAFT. Art by GENE COLAN, DON HECK, FRANK SPRINGER, and VIRGILIO REDONDO. Continuing the best-selling B&W collection of Marvel's classic horror title! Is Dracula dead? Allowing his hunters to think him destroyed, the Lord of the Undead lies in wait while his secret machinations split Blade, Frank Drake, Quincy Harker, and Rachel Van Helsing apart - setting them up for his final attack. Guest-starring Dr. Strange and Brother Voodoo!